Last week I had an interesting incident at a customer. The customer reported that one of multiple Veeam backup jobs jobs constantly failed. The user, that was used to connect to the vCenter, was an Active Directory located account. The account were granted administrator privileges root of the vCenter. Switching from an AD located account to Administrator@vsphere.local solved the issue. Next stop: vmware-sts-idmd.log on the vCenter Server appliance. The error found in this log confirmed my theory, that there was an issue with the authentication itself, not an issue with the AD located account. 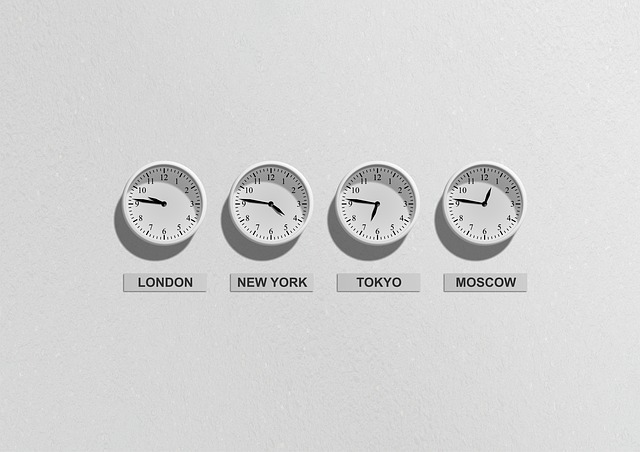 To make a long story short: Time differences. The vCenter, the ESXi hosts and some servers had the wrong time. vCenter and ESXi hosts were using the Domain Controllers as time source. This is the ntpq output of the vCenter. You might notice the jitter values on the right side, both noted in milliseconds. vcenter:/storage/log/vmware/sso # ntpq ntpq> peer remote refid st t when poll reach delay offset jitter ============================================================================== vmdc2.ad. 192.168.16.11 2 u 53 64 363 0.532 207.553 152007. vmdc1.ad. .LOCL. 1 u 2 64 377 0.257 204.559 161964.
vmdc2.ad. 192.168.16.11 2 u 53 64 363 0.532 207.553 152007.
vmdc1.ad. .LOCL. 1 u 2 64 377 0.257 204.559 161964. After some investigation, the root cause seemed to be a bad DCF77 receiver, which was connected to the domain controller that was hosting the PDC Emulator role. The DCF77 receiver was connected using an USB-2-LAN converter. Instead of using a DCF77 receiver, the customer and I implemented a NTP hierarchy using a valid NTP source on the internet (pool.ntp.org). 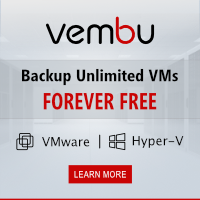 This entry was posted in Backup, Software, Virtualization and tagged backup & replication, troubleshooting, veeam, vExpert, vsphere on July 8, 2018 by Patrick Terlisten. The OVF file includes a line with the VM hardware version. 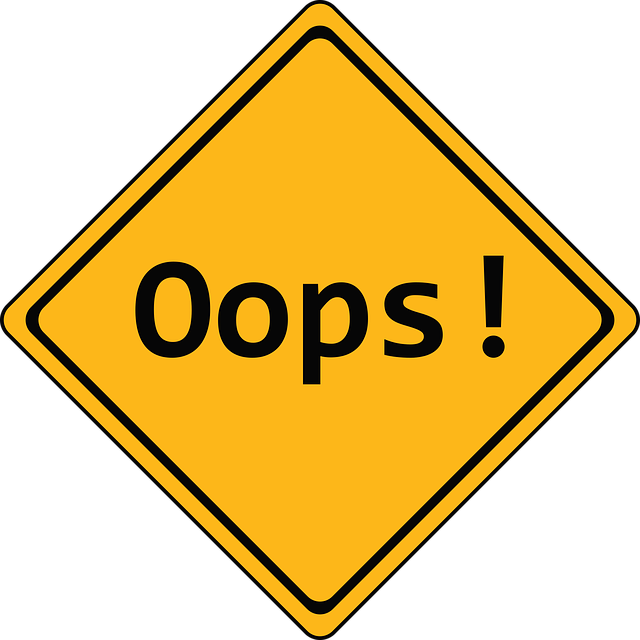 If you change this line from vmx-06 to vmx-07, the hash of the OVF changes, and you will get an error during the deployment of the appliance because of the wrong file hash. You have to change the SHA256 hash of the OVF, which is included in the MF file. To create the new SHA256 hash, you can use the PowerShell cmdlet Get-FileHash . Replace the hash and save the MF file. Then re-deploy the appliance. This entry was posted in Virtualization and tagged troubleshooting, vExpert, vmware, vsphere on February 23, 2018 by Patrick Terlisten. No VMware-certified partner names have been mentioned nor have any partners collaborated with VMware in engineering this offering. This offering has been developed independent of VMware, and is neither certified nor supported by VMware. Microsoft recognizing the leadership position of VMware’s offering and exploring support for VMware on Azure as a superior and necessary solution for customers over Hyper-V or native Azure Stack environments is understandable but, we do not believe this approach will offer customers a good solution to their hybrid or multi-cloud future. Looks like VMware is not happy about Microsofts annoucement. And this blog post clearly states, that VMware will not partner with VMware to bringt VMware virtualization stack on Azure. I don’t know if this is a wise decision of VMware. The hypervisor, their core product, is a commodity nowadays. We are taking about a bare-metal solution, so it’s not different from what VMware build with AWS. It’s more about how it is embedded in the cloud services and cloud control plane. If you use VMware vSphere, Horizon and O365, the step to move virtualization workloads to VMware on Azure is smaller, than move it to AWS. On November 23, 2017, the register published this interesting analysis: VMware refuses to support its wares running in Azure. Yesterday, Microsoft announced new services to ease the migration from VMware to Microsoft Azure. Corey Sanders (Director of Compute, Azure) posted a blog post (Transforming your VMware environment with Microsoft Azure) and introduced three new Azure services. Azure Migrate can discover your VMware-hosted applications on-premises, it can visualize dependencies between them, and it will help customers to create a suitable sizing for the Azure hosted VMs. Azure Site Recovery (ASR) is used for the migration of workloads from the on-premises VMware infrastructure to Microsoft Azure. At the end, when your applications are running on Microsoft Azure, the free Azure Cost Management service helps you to forecast, track, and optimize your spendings. 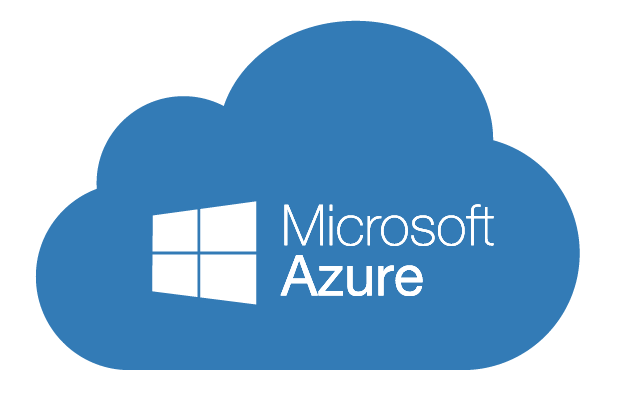 Many of the current available Azure services can be used with your on-premises VMware infrastructure, without the need to migrate workloads to Microsoft Azure. This includes Azure Backup, Azure Site Recovery, Azure Log Analytics or managing Microsoft Azure resources with VMware vRealize Automation. Bam! Microsoft announces the preview of VMware vSphere on Microsoft Azure. It will run on bare-metal on Azure hardware, beside other Azure services. The general availability is expected in 2018. This is the second big announcement about VMware stuff on Azure (don’t forget VMware Horizon Cloud on Microsoft Azure). And although I believe, that this is something that Microsoft wants to offer to get more customers on Azure, this can be a great chance for VMware. VMware customers don’t have to go to Amazon, when they want to host VMware at a major public cloud provider, especially if they are already Microsoft Azure/ O365 customers. This is a pretty bold move from Microsoft and similar to VMware Cloud on AWS. I’m curious to get more details about this. This entry was posted in Cloud and tagged azure, cloud, microsoft, vmware, vsphere on November 22, 2017 by Patrick Terlisten. Today, I had a very interesting discussion. As part of an ongoing troubleshooting process, console screenshots of virtual machines should be created. The colleagues, who were working on the problem, already found a PowerCLI script that was able to create screenshots using the Managed Object Reference (MoRef). But unfortunately all they got were black screens and/ or login prompts. Latter were the reason why they were unable to run the script unattended. They used the Get-VMScreenshot script, which was written by Martin Pugh. I had some time to take a look at his script and I created my own script, which is based on his idea and some parts of his code. This file is also available on GitHub. One important note: If you want to take console screenshots of VMs, please make sure that display power saving settings are disabled! Windows VMs are showing a black screen after some minutes. Please disable this using the energy options, or better using a GPO. Otherwise you will capture a black screen! This entry was posted in Development and tagged devops, powercli, powershell, vExpert, vmware, vsphere on February 28, 2017 by Patrick Terlisten. I wanted to retire my Synology DS414slim, and switch completely to vSAN. Okay, no big deal. Many folks use vSAN in their lab. But I’d like to explain why I moved to vSAN and why this move failed. I think some of my thoughts are also applicable for customer environments. So far, I used a Synology DS414slim with three Crucial M550 480 GB SSDs (RAID 5) as my main lab storage. The Synology was connected with two 1 GbE uplinks (LAG) to my network, and each host was connected with 4x 1 GbE uplinks (single distributed vSwitch). The Synology was okay from the capacity perspective, but the performance was horrible. RAID 5, SSDs and NFS were not the best team, or to be precise, the CPU of the Synology was the main bottleneck. 1,2 GHz is not enough, if you want to use NFS or iSCSI. I never got more than 60 MB/s (sequential). The random IO performance was okay, but as soon as the IO increased, the latencies went through the roof. Not because the SSDs were to slow, but because the CPU of the Synology was not powerful enough to handle the NFS requests. The workaround for the poor random IO performance was adding more flash storage. This time, the flash storage was added to the hosts. I used PernixData FVP to boost my lab. FVP was a quite cool product (unfortunately it was a cool product.) PernixData granted me, as a PernixPro, some licenses for my lab. The acquisition of PernixData by Nutanix, the missing support für vSphere 6.5, and the end of availability of all PernixData products led to the decision to remove PernixData FVP from my lab. 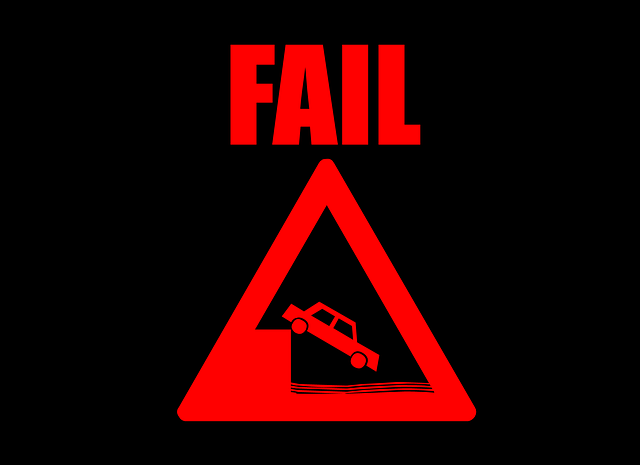 Without PernixData FVP, my lab was again a slow train crawling up a hill. Four HPE ProLiant, with enough CPU (40 cores) and memory resources (384 GB RAM) were tied down by slow IO. in stock. The 40 GB SSDs were to small and slow, so I replaced them with 120 GB SSDs. I was able to equip three of my four hosts with SSDs. Three hosts with flash storage were enough to try VMware vSAN. Fortunately, not all hosts have to add capacity to a vSAN cluster. Hosts can also only consume storage from a vSAN cluster. With this in mind, vSAN appeared to be a way out of my IO dilemma. In addition, using the 480 GB SSDs as capacity tier, a vSAN all-flash config was possible. 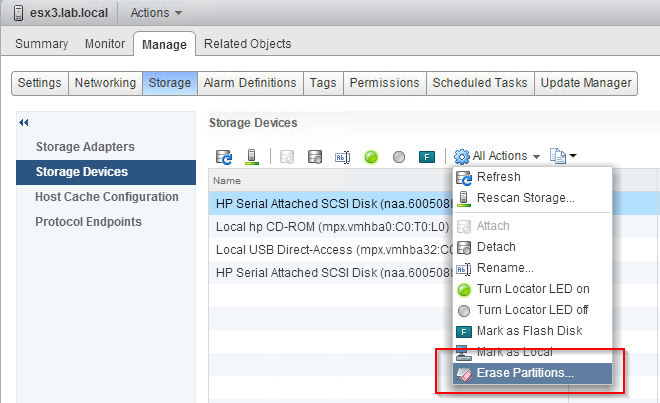 It took me a little time to move around VMs to temporary locations, while keeping my DC and my VCSA available. I had to remove my datastore on the Synology to free up the 480 GB SSDs. 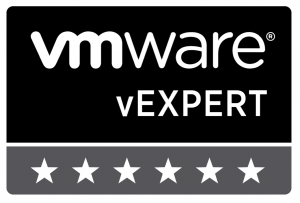 The necessary vSAN licenses were granted by VMware (vExpert licenses). The creation of the vSAN cluster itself was easy. Fortunately, wiping partitions from disks is easy. You can use the vSphere Web Client to do this. As the load increased, the errors became more severe. WARNING – WRITE Average latency on VSAN device %s is %d ms an higher than threshold value %d ms WARNING – WRITE Average Latency on VSAN device %s has exceeded threshold value %d ms %d times. WARNING – WRITE Average Latency on VSAN device %s has exceeded threshold value %d ms %d times. I was able to solve this with a blog post of Cormac Hogan (VSAN 6.1 New Feature – Handling of Problematic Disks). Even without compression and deduplication, the performance was not as expected and most times to low to work with. At this point, I got an idea what was causing my vSAN problems. To be honest: The budget is the problem. I had to take consumer-grade SSDs. This is a screenshot from the vSAN Observer. esx1 to esx3 are equipped with SSDs, esx4 is only consuming storage from the vSAN cluster. This blog post of Duncan Epping (Why Queue Depth matters!) is a bit older, but still valid in my case. The controller I use (HPE Smart Array P410i) has a a deep queue (1011), the RAID device has a queue length of 1024, but the SATA SSDs have only a queue length of 32. Here’s the disk adapter and disk device view of ESXTOP. Do not try this at production kids. Go vSAN, but please use the right hardware. 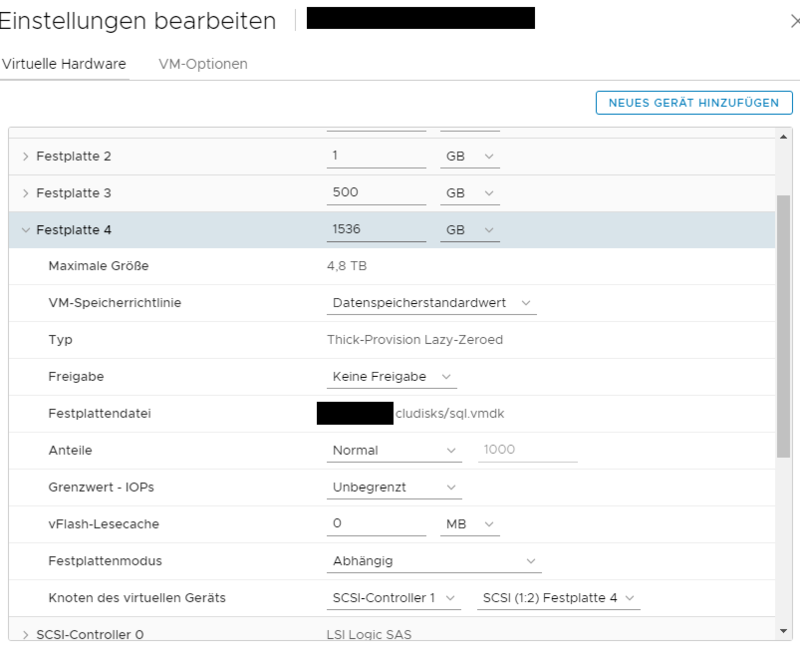 This entry was posted in Virtualization and tagged storage, vExpert, vmware, vsan, vsphere on November 1, 2016 by Patrick Terlisten. A few days ago, I ran into a very nasty problem. Fortunately, it was in my lab. Some months ago, I replaced the certificates of my vCenter Server Appliance (VCSA), and I’ve chosen to use the VMware Certificate Authority (VMCA) as a subordinate of my AD-based enterprise CA. The VMCA was used as intermediate CA. The certificates were replaced using the vSphere 6.0 Certificate Manager (/usr/lib/vmware-vmca/bin/certificate-manager), and I followed the instructions of KB2112016 (Configuring VMware vSphere 6.0 VMware Certificate Authority as a subordinate Certificate Authority). The VCSA was migrated from vSphere 5.5, and with vSphere 5.5 I was also using custom certificates. These certificates were also issued by my AD-based enterprise CA, and these certificates were migration during the vSphere 5.5 > 6.0 migration. 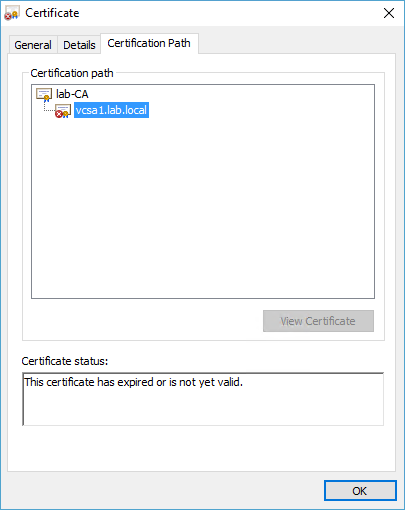 So at the end, I replaced custom certificates with VMCA (as an intermediate CA) certificates. Error occurred while processing request. Check vSphere WebClient logs for details. HTTP Status 400 - An error occurred while sending an authentication request to the PSC Single Sign-On server - null type Status report message An error occurred while sending an authentication request to the PSC Single Sign-On server - null description The request sent by the client was syntactically incorrect. description The request sent by the client was syntactically incorrect. This error led me to KB2144086 (Updating certificates using certificate manager on vCenter Server or PSC 6.0 Update 1b fails), but was able to proof, that I have used different subject names for the different solution user certificates. This was the original custom certificate, issued by my AD-based enterprise CA, and installed on my vSphere 5.5 VCSA. Aaron also offered the solution by referencing KB2118939 (Replacing the Lookup Service SSL certificate on a Platform Services Controller 6.0). I followed the instructions in KB2118939 and replaced the certificate of the Lookup Service with a certificate of the VMCA. With vSphere 6.0, the Lookup Service should be accessed through the HTTP Reverse Proxy. This proxy uses the machine certificate. Therefore, an expired Lookup Certificate is not obvious. If you connect directly to the Lookup Service using port 7444, you will see the expired certificate. The Lookup Service certificate is not replaced with a custom certificate, if you replace the different solution user certificates. If you have a vSphere 6.0 VCSA, which was migrated from vSphere 5.5, and you have replaced the certificates on that vSphere 5.5 VCSA with custom certificates, you should check your Lookup Service certificate immidiately! Follow KB2118939 for further instructions. Credit to Aaron Smith for this blog post. Thank you! This entry was posted in Virtualization and tagged ssl, troubleshooting, vExpert, virtualilization, vmware, vsphere on October 25, 2016 by Patrick Terlisten. Apparently it’s “how to monitor hardware status” week on vcloudnine.de. Some days ago, I wrote an article about using SNMP for hardware monitoring. You can also use the vSphere Web Client to get the status of the host hardware. A third way is through the vSphere API. I just want to share a short example how to use vSphere API calls and pyVmomi. pyVmomi is the Python SDK for the VMware vSphere API. I just want to share a small example, that shows the basic principle. The script gathers the temperature sensor data of a ProLiant DL360 G7 running ESXi 6.0 U2 using vSphere API calls. Nothing fancy. You can easily loop through numericSensorInfo to gather data from other sensors. Use the Managed Object Browser (MOB) to navigate through the API. This is handy if you search for specific sensors. If you need accurate data, the vSphere API is the way to go. If you focus on something lightweight, try SNMP. This entry was posted in Virtualization and tagged devops, python, vExpert, vmware, vsphere on July 9, 2016 by Patrick Terlisten. I thought, everyone knows it, but I’m always being asked “Where’s the hardware status tab?” after an update from vSphere 5.x to 6. Many customers still use the vSphere Client (C # client), and steer clear of the vSphere Web Client. To be honest: Me too. I often use the C# client, especially if I do mass operations, or for a quick look at something. This is really nothing new, the answer is clear. But I think it’s a good idea to write it down. At least for myself. As a reminder to use the vSphere Web Client. 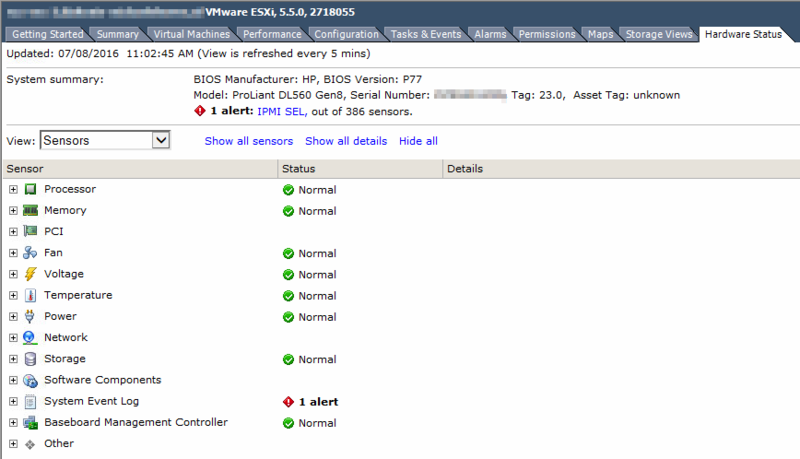 Many customers used the hardware status tab to get a quick overview about the health of the ESXi host hardware. 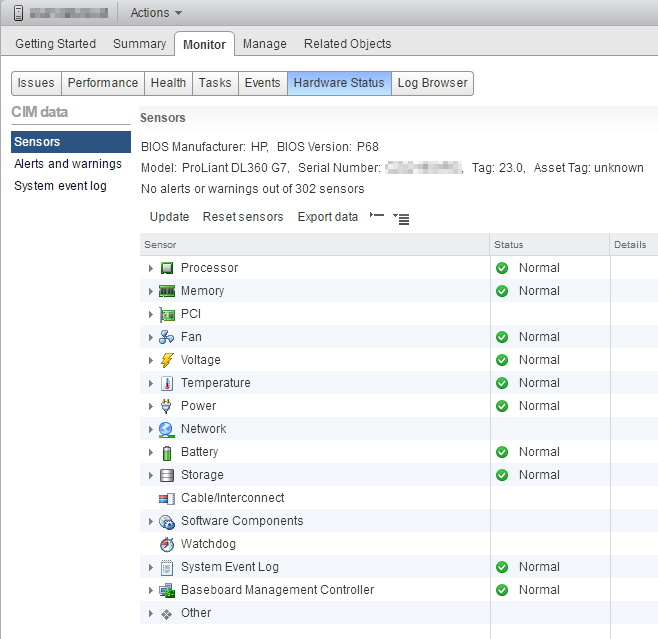 But after an update to vSphere 6 the hardware status tab is missing in the vSphere Client. This is an expected behaviour! VMware has published an knowledge base article about this (The Hardware Status Tab is no longer available in the vSphere Client after upgrading to vCenter Server 6.0). The only solution is to use the vSphere Web Client. Meanwhile, the old vSphere Client has many downsides. All features introduced in vSphere 5.5 and later are only available through the vSphere Web Client. This also applies to the hardware status tab. You find the hardware status on the “Monitor” tab of a host. It offers the same information as the legacy hardware status tab from the vSphere Client. Do yourself a favor and use the vSphere Web Client. Always, any time. This entry was posted in Virtualization and tagged vExpert, vmware, vsphere on July 9, 2016 by Patrick Terlisten.